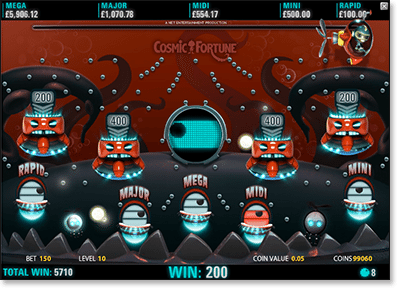 Cosmic Fortune is one of the most inventive, entertaining, and potentially rewarding online progressive pokies on the market. Find out how to play this progressive jackpot slot game for real money at the best casinos on the Web. Drawing inspiration from classic arcade games such as Space Invaders and the Galaxian series, Net Entertainment has turned everything up to 11 for this one. The result is a vibrant and unique 5 x 3 reel video slot with unbeatable graphic quality, wonderful bonus features, and no less than five separate jackpots to be won. 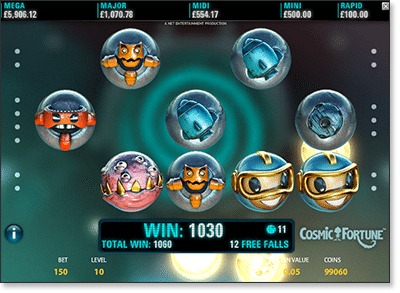 You can play the Cosmic Fortune progressive slot at any of our trusted NetEnt casinos recommended in our casino above, each of which accepts Australian dollars and offers a generous sign-up bonus to new real cash players. The first thing you will notice about the Cosmic Fortune real money slot game is the dazzling audio-visual quality on display. The intro video alone is enough to get you hooked: a vivid recreation of those classic space shooter video games of the late ’70s and early ’80s, which then finishes on an animated sequence reminiscent of a Disney Pixar film. And that’s before we have even started the game. Most progressive pokie machines are fairly restrictive when it comes to betting options, as they often require us to put up several bucks just to play a single spin. Not so with Cosmic Fortune, which caters to all kinds of Australian slots players with a broad range of wagering levels and coin sizes. There are 10 fixed bet levels – ‘1’ being the lowest, ’10’ the highest – each of which covers the full 15 paylines. When playing for real cash, there are four coin denominations to choose from: 0.05, 0.10, 0.20, and 0.50. Thus, the minimum stake for Cosmic Fortune is $0.75 (0.05 coin on bet level 1) and the maximum bet is $75.00 (0.50 coin on bet level 10) – a nice wide spread which leaves room for recreational punters, hi-stakes pokies players, and all folks in between. 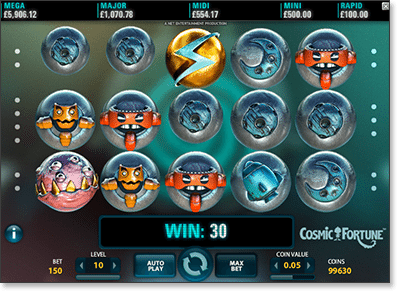 The Cosmic Fortune base game gives us 15 fixed paylines across five reels with three rows of symbols – a common layout for online pokies. However, it only takes a few spins to realise this progressive gem is anything but standard. Whenever you a hit a winner, the paying symbols vanish to make way for new ones and the rest slide down to fill the gaps. This process repeats until there are no more winning combos on the board, so you can essentially get multiple spins (and several wins) for the price of one. Wilds symbols – the ones with golden ‘W’ on them – can appear on reels two, three, and four during the main game and bonus rounds. They can substitute for any other Cosmic Fortune symbol, with the sole exception of scatters. The scatter feature is represented by the golden balls with blue lightning bolts. Land three or more of these anywhere on the reels to unlock the Free Falls bonus game. The road to Cosmic Fortune’s progressive jackpots is paved with riches, including a free spins round and two separate bonus games. Get three scatters anywhere on the board to activate 10 bonus spins in the Free Falls round. For each additional scatter symbol, you get an extra five spins – so four scatters equals 15 Free Falls and five scatters gets you 20. With the Avalanche feature in play, we can rack up huge wins during Free Falls – but that’s only half the story. Every time you win on free spins, each symbol in the combination is converted into a marble. For example: if we match up five symbols, we get five marbles; and if we get a combination made up of seven symbols, then we get another seven marbles. But what are these so-called “marbles” for, you ask? Once you have used up your Free Falls and the Avalanche feature has played out, the second stage of the jackpot trail begins. Remember that handheld pinball-style game you used to get in Happy Meals as a kid, where you had to tilt and nudge a bunch of tiny ball bearings into various holes? The Cosmic Fortune Bonus Game is like an animated real cash version of that, with a guy in a spaceship dropping marbles into a maze of pins and bumpers. The more marbles you win in the Free Falls round, the more chances you get to win cash prizes and, if you’re lucky, progress even further. The smallest two – the Rapid Jackpot and Mini Jackpot – are fixed value prizes which pay around $100 and $500 respectively. The other three – the Midi Jackpot, Major Jackpot, and Mega Jackpot – increase with every bet made on the game via NetEnt’s progressive jackpot network. The Mega prize can pay tens of thousands of dollars. The Jackpot Game works much like the previous bonus round, except there are five collector cups labelled ‘Rapid’, ‘Mini’, ‘Midi’, ‘Major’, and ‘Mega’ – each of which has a meter to show how many marbles have gone in. To win a jackpot prize, you must fill up one of the meters by getting three marbles into the corresponding cup. Net Entertainment has nailed this one, blending 1980s nostalgia with all the mod cons we have come to expect from one of the world’s leading developers of online casino games. And it will only get better in the coming months and years, for those progressive jackpots will go up and up and up as more people catch on to this cracker of a game.